Calling all Toronto foodies. If you haven't heard about it yet, hear me now YUM TUM is coming up again this Sunday and there are still tickets available at the door for $15 smackeroos. If you have absolutely no idea what I'm talking about and you live in Toronto, and you call your self a foodie then shame on you! 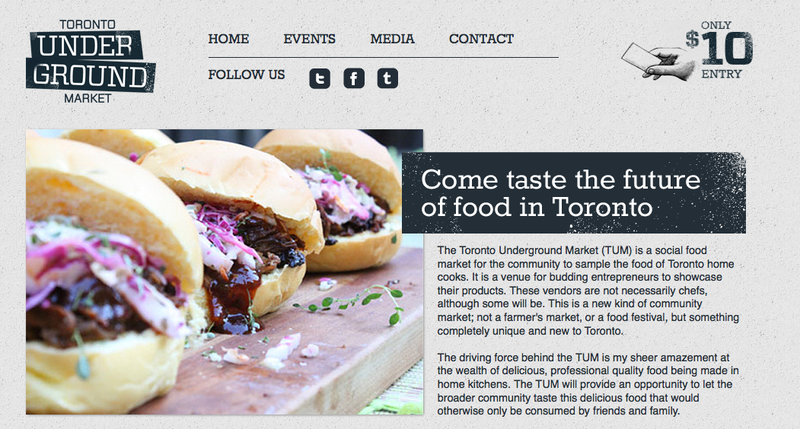 Yum Tum is a fabulous underground culinary market that showcases the best and brightest new gastronomic talents. A meeting and greeting place for some of the cities unsung food makers and shakers. What is so unique about this market is that it showcases home cooks and budding entrepreneurs the talent you just don't get to experience in the restaurant scene. I'm going to be there scoping it out, doing some tasting and looking for inspiration for my own culinary adventures at The Fooding Company. We are hoping to participate at the next Yum Tum so this will give me a good idea of what's missing from the market and what's amazing do not try this at home kinda stuff. The concept is derived from a totally underground covert culinary ring in San Fransisco Basically the concept was a place for local forgers and home cooks to quietly offer their "goods" to an elite public with out having to worry about the overhead cost of restaurants, licences and commercial bs. Unfortunately like all good things the market was discovered by too many and shut down by authorities last August. Ms. Aviles the Toronto organizer has set up an excellent system by which all vendors must prep and cook in Evergreen’s commercial, fully inspected events kitchen, thus keeping the market safe for all parties and protected from the threat of ever being shut down. I'm super excited for Sunday and hope to see some of you out there. Chow for now! Hello fellow foodies. Hope everyone had a delicious weekend. Today I'm posting a yummy recipe for all my gluten suggestively challenged readers out there. 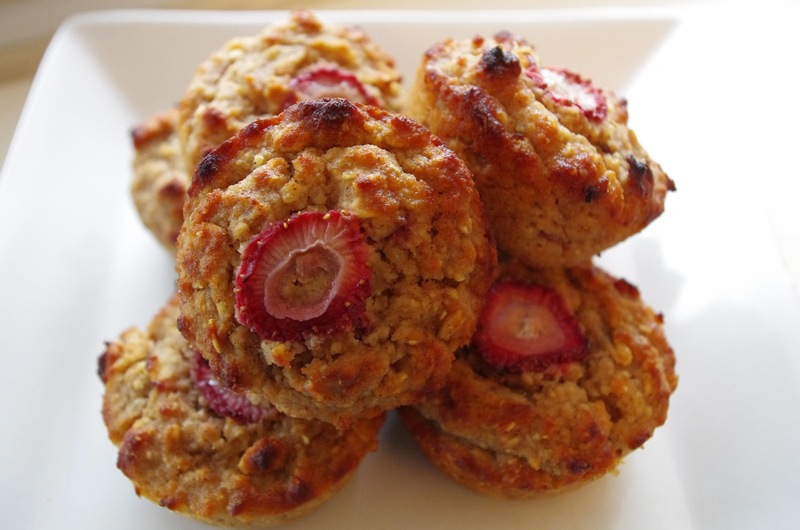 These muffins pack a double punch of fiber from the oats & coconut flour and are filled with low fat goodness. Coconut flour is gluten free and has a beautiful subtle sweetness. Take that "Eat yourself Skinny"! I tease, Erin is a super awesome calorie crunching blogger. One of the best things about making muffins is that all you really need is a fork in place of a whisk, a bowl and obviously muffin pan. 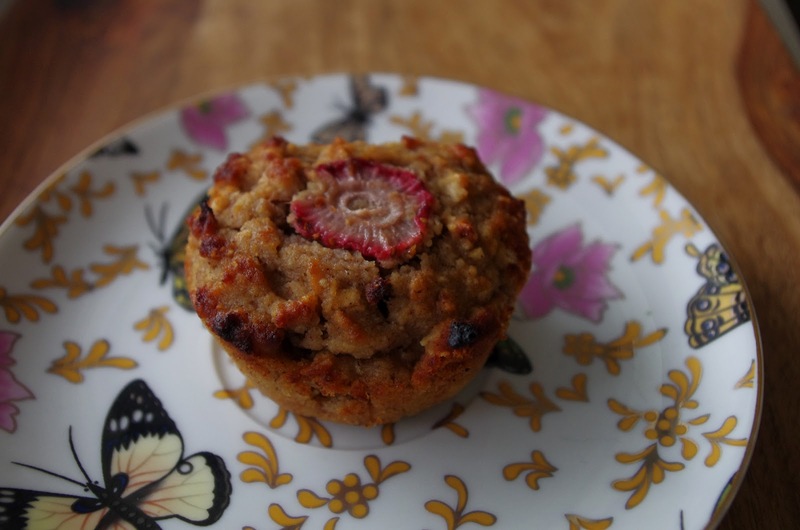 I love making these muffins and freezing them - they make an excellent breakfast or snack after a few mins in the oven or microwave. The key is using over ripe frozen bananas. PREP: Pre heat oven at 350 degrees. For the oats, I like to divide and grind (in Cuisinart or spice grinder) 1/2 of the portion, then use the other 1/2 whole. Combine dry ingredients in a bowl or glass measuring cup, mix. Whisk all wet ingredients. BAKE: Spray muffin pan and fill each 3/4 full. Place thinly sliced strawberry on top. Bake for 20- 25 mins. Test with a toothpick after 20. If you follow me on twitter, you may have noticed that as of lately a bunch of my tweets have been talking about delicious fruit vegetable juices you can make at home. I guess I've been inspired by Jo. 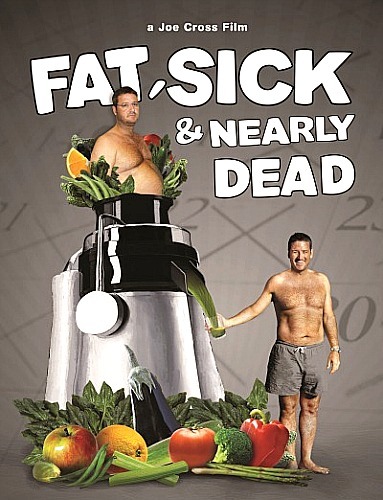 Recently my friend Billy told me about this great documentary called "Fat sick and nearly dead". The film is about an over weight Australian named Jo who travels to America to go on a 60 day juice fast. I'm not going to say too much more except watch the trailer and if you intrigued as I was, give the movie a shot. I'm not advocating a juice fast, but just simply trying to share some interesting information presented through an extremely entertaining format. Plus I've become obsessed with drinking fresh fruit and vegetable juice and highly recommend incorporating it in some way into your lifestyle. Beware though juicing my lead to obsessive compulsions to purchase an abundance of fruits and vegetables, and over juicing can cause extreme explosive diarrhea. Yes I speak from experience however I will spare you the ugly details. Cheers! Tonight I have a late but healthy post for all you Tomato Snobs out there. I'm very sorry I'm not posting at the rate by which you've all become accustom to, but being an ambitious entrepreneur has left me with far less time for my blogging. 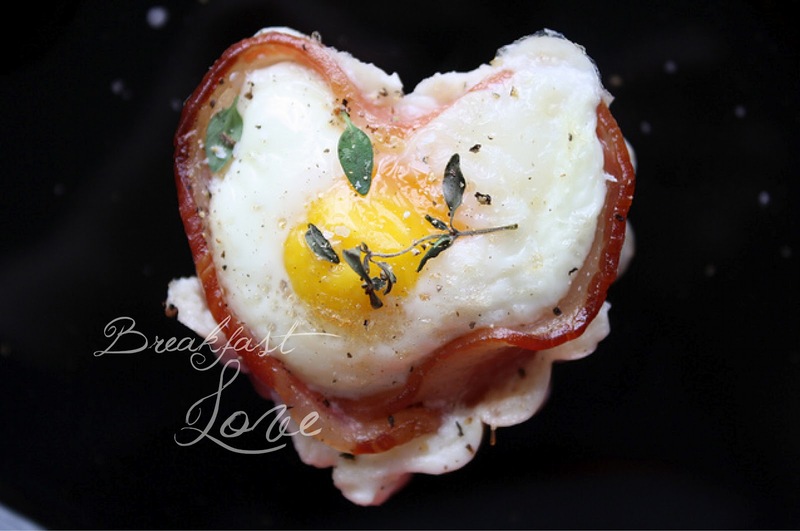 I want you all to know I'm doing my best and promise to try for a few extra short post here and there with interesting foodie info to tie you over until my next recipe. This dinner salad is yum, and was literally thrown together with a bunch of leftovers I had hanging around my fridge. Who says leftovers have to be boring. Seriously, I dare you all to try repurposing your leftovers. some time. Ther results may surprise you. All you need is some protein, salad greens, chopped veg, possibly a carb and a pantry item or two. I'd like to thank my dad & stepMO for providing said leftover grilled steak for this stunning creation. Now that I've got leftovers on the brain I'm thinking a contest might be on the horizon. Stay tuned - first I must find a worthy prize to offer up! This is a requested post by Samantha, a super cool yoga instructor from Toronto that The Fooding Company had the pleasure of cooking for last weekend. This soup is vegan friendly and absolutely delicious, not to mention it's pretty damn easy to make if you've got an immersion blender and 30 minutes or so. You'll need to go out and find the specialty black volcanic sea salt, or you could skip this ingredient if you can't be bothered. Be warned though the salt definitely adds a certain je ne sais quoi that can't be replaced by anything else. *Check out Samantha's fb page for Yogabodii her in home yoga practice. FOR SOUP: Rough chop all veg. Heat a drizzle of infused oil in a pot, add shallots and cook until translucent. Add parsnips, s&p and continue cooking for 5 mins (parsnips will take longer to soften then the supple pears). Add pears & thyme continue to cook everything until golden (you want everything to have a nice caramelized look). Turn your heat down and add coconut milk & water. Let that cook for another minute or so then turn heat off completely before blending. Add more or less water to obtain desired consistency. FOR COCONUT GRANOLA: Add a handful or two of coconut to a non stick pan and toast on medium high, constantly agitating the pan. Watch carefully the coconut can burn very quickly because of it's sugar. Remove from pan immediately after desired colour has been achieved or coconut will continue to cook - and burn if left in the pan. 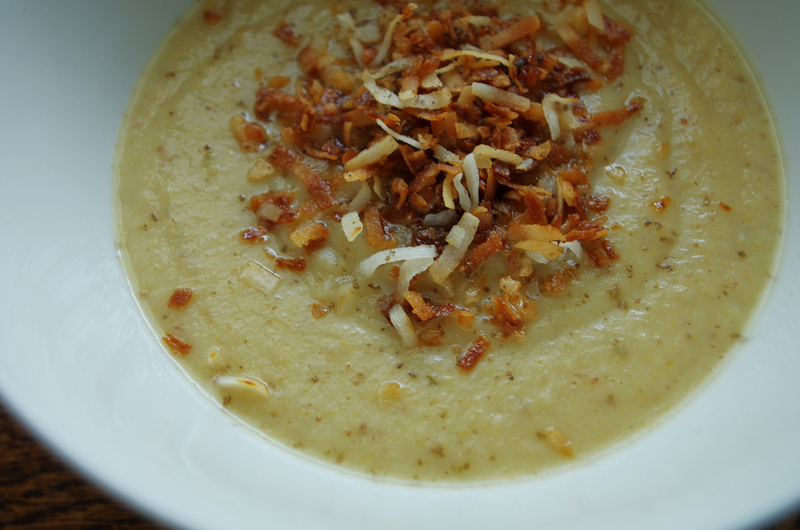 SERVE: With a sprinkle of coconut, black salt and drizzle of olive oil. Good day all. I'm just slammed this week, and probably wont have a lot of time to blog. I wanted to take a moment to share a photo by Heather Christo and wish all my lovely readers a very happy Valentines day. 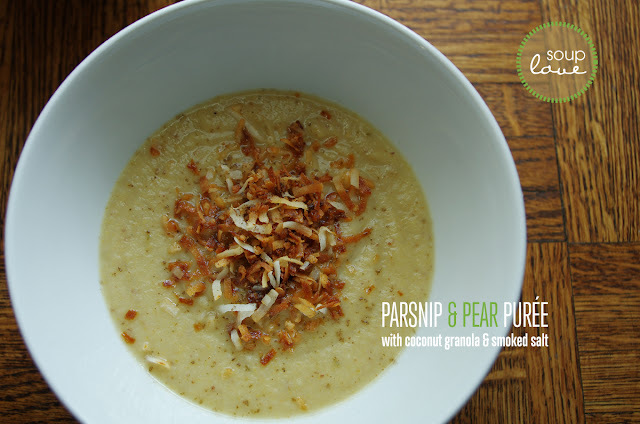 I promise when things start to slow down I'll post a few recipes including a parsnip & pear puree that's to die for. Hugs and kisses to all of you. I have a serious girl crush on Donna Hay. She's a legendary food stylist and magazine editor from Australia. 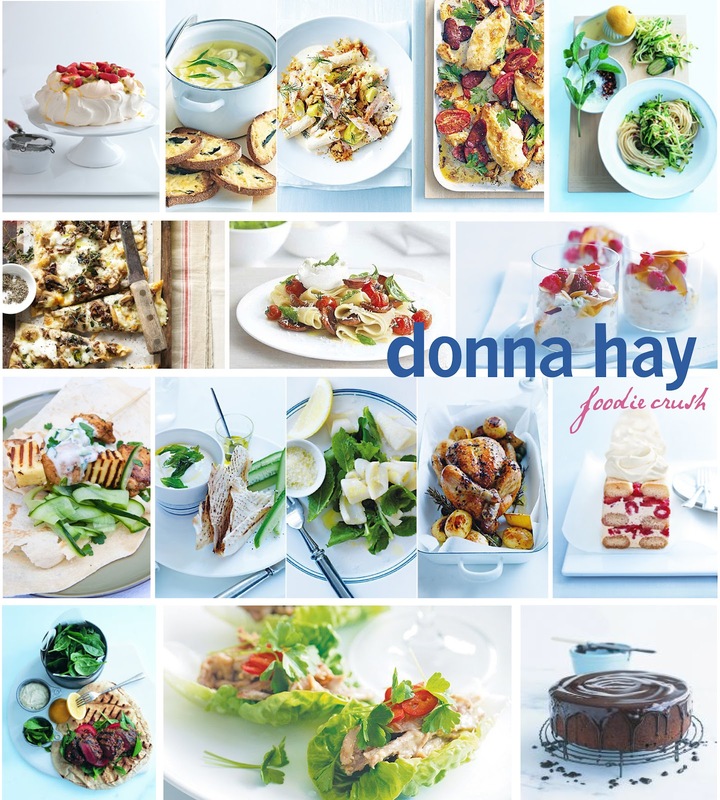 Donna is a power house best selling author with 14 cook books under her belt with over 3 million copies sold worldwide. In 2011 she partnered with Royal Doulton to develop her own kitchenware line. She has also acted as one of the guest judges on MasterChef Australia one of my absolute favorite culinary shows (much better then it's American counterpart). In short I want to be her. 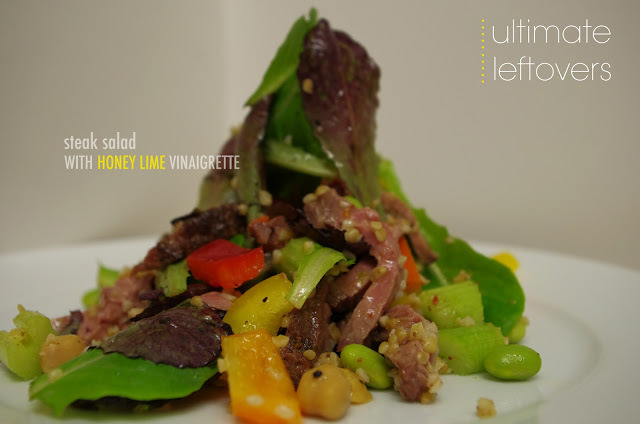 Her simple recipes and elegant style is something any culinarian would be inspired by. I would absolutely die if I ever got to meet or work with her. Perhaps one day... a girl can dream right? 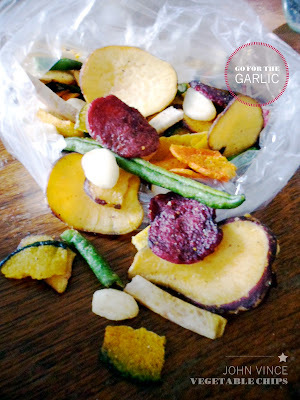 Vegetable chips - look good, taste bad! I wanted to share with you some insider information on a little place called John Vince foods. Describing it as little is a pretty BIG understatement. This place is like Bulk Barn on crack. There are literally rows and rows of vats filled with any dry good, nut, fruit, chocolate, candy, seasoning you can imagine. Actually they are kind of lacking in the seasoning department but only compared to an actual spice market. Upon my last visit to John Vince I laid my eyes on what looked like some seriously beautiful vegetable chips. After my taste buds further inspected them I found these stunning chips to taste more like putrid vile death. Like they were injected with food colouring or synthetic rubbish instead of natural sweet vegetable goodness. The entire bag of chips were pretty inedible except for the surprising bite of yumminess which came in the form of a lovely puffed garlic chip. These are deadly delicious and will definitely give you dragon breath - totally worth it though. If you find yourself at JVF anytime soon do yourself a favor and skip the mixed veg blend and go strait for those little garlicy puffs of heaven. Also avoid the chocolate covered raisins - they're kinda grainy and dry. Most of the other products I've tried have been great. The dried fruit are top notch especially the cranberries I tried the last time I was there. They were nothing like the ones you get at the grocery store which are almost impossible to differentiate next to a raisin or dried cherry. The next time you need to stock up on bulk goods give this place a try. The size of it is pretty mind blowing and they have great deals on the jumbo 3L olive oil tins and passata a must have in any Tomato Snob's pantry. Over all JVF gets four stars but sadly the vegetable chips only one. Chow for now! Howdy all. I'm sure you've been wondering when I would come back with a new post. Unfortunately I'm still not feeling 100%, kinda run down and weak, but I just couldn't put you all though another Monday without a post. Today I'm going to keep it short and sweet since I don't really have a "recipe" for this dish. 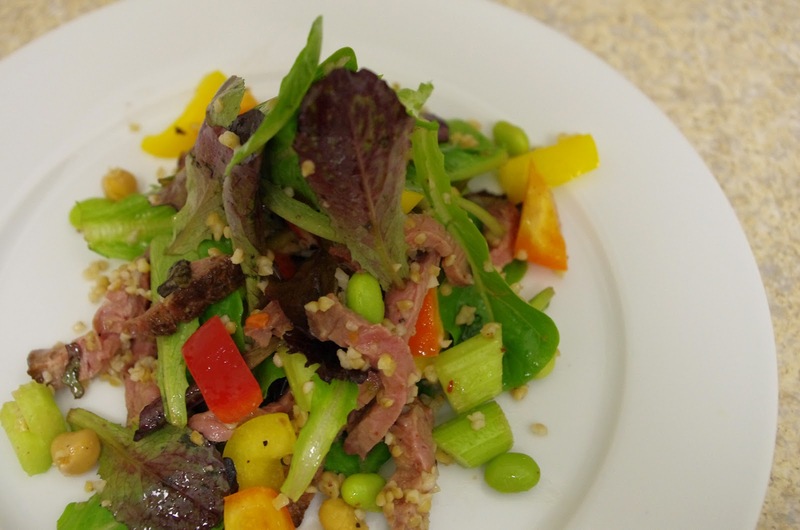 The dinner was really thrown together simply and ended up being delicious not to mention #healthy. Don't be intimidated by the long list of Asian ingredients - they really aren't that scary. 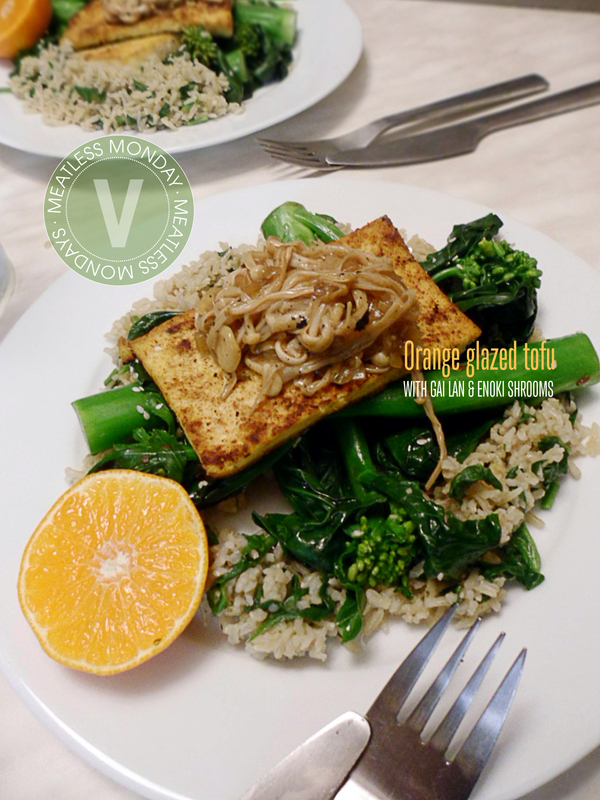 They definitely inject a lot of pungent yumminess "umami" to this veganlicious dish. For rice - 1 cup of rice to two cups of vegetable stock (or water). Add a 1 inch knob of ginger, a smashed clove of garlic, and star anise to the liquid plus a drizzle of sesame oil & soy sauce. Bring to a boil, then cover and lower the heat to medium (simmer) for 20 mins or until all the liquid has evaporated. Add some chopped cilantro to the rice before serving - if you're not a fan of cilantro mint or parsley will also work. For the gai lan - "blanch & shock" bring a pot of salted water to a boil, cook the broccoli for 30- 45 seconds then straight into cold water. Then quick stir fry in a hot pan with sesame oil or cold infused olive oil. For the mushrooms - sautée mushrooms in a small drizzle of oil for 2 mins then hit it with a splash of soy sauce. For the tofu - slice tofu into two or three thinner slices and press between paper towel to remove the excess moisture. Dust each slice with Chinese 5 spice & salt. Bring a tbsp of sunflower oil with a drop of sesame oil to a high heat. Then fry the tofu until crispy on each side (about 2 mins), then squeeze the a tangerine's juice over to create the simple glaze. 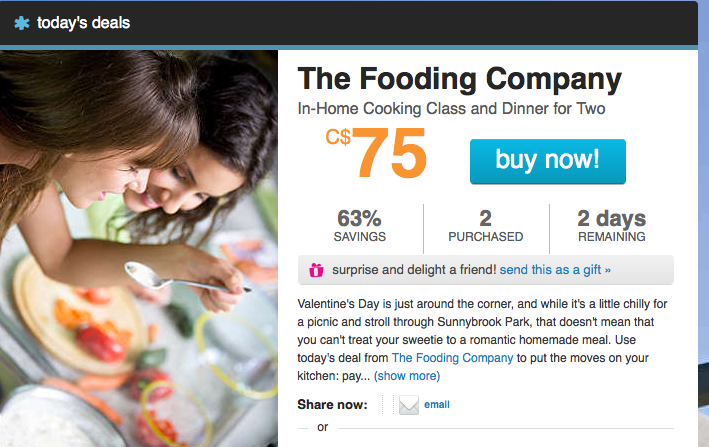 Just a quick post this a.mm to tell you about the awesome deal my company is running today on Living Social. We are offering for $75 dollars an in home cooking demo for two dinner included (or brunch). I wanted to let my readers know just in case any of you are interested. 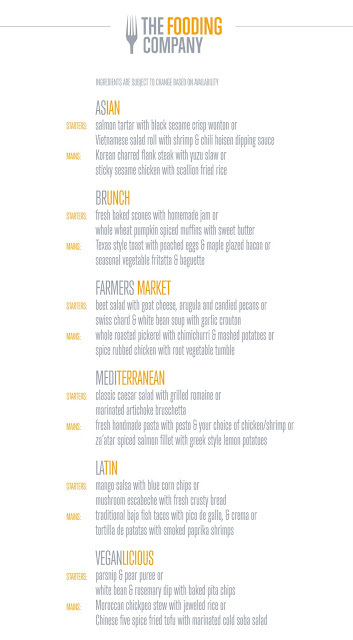 I'll also post the menu so can temp yourself. P.S. I'm finally starting to feel better so expect a post over the weekend. 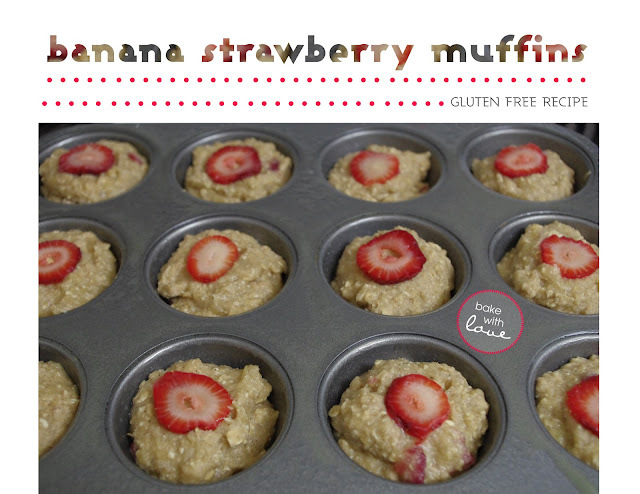 I'm thinking my ultimate gluten free breakfast muffins.